J•DRAIN SWD-6 is a modular composite drainage and collection system consisting of a 3-dimensional, high-flow, drainage core which is wrapped with a non-woven filter fabric. It is designed to replace a conventional sand or gravel covered pipe drain around building foundations and retaining walls. Soil particles are held back by the filter fabric allowing water to pass through to the drain core for easy removal by sump or by running to daylight. Available in 6 inch and 12 inch widths. A full array of fittings are available in the system to allow for a fast and easy installation. J-Clips are used to hold the SWD vertically against the foundation wall for a secure hold and J-Tape is used to attach all J•DRAIN fittings. 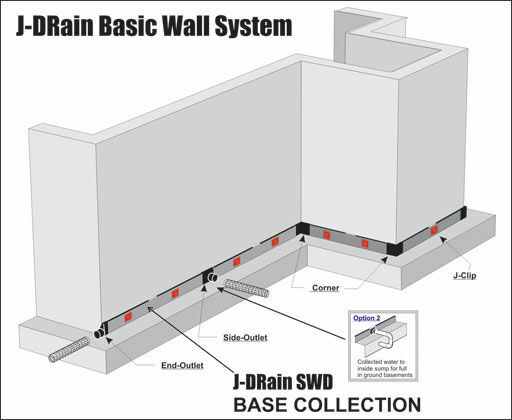 Combines J•DRAIN SWD collection system with 4 ft of J•DRAIN wall drainage composite. This allows a passage for water towards the bottom of the foundation wall to the collection system. 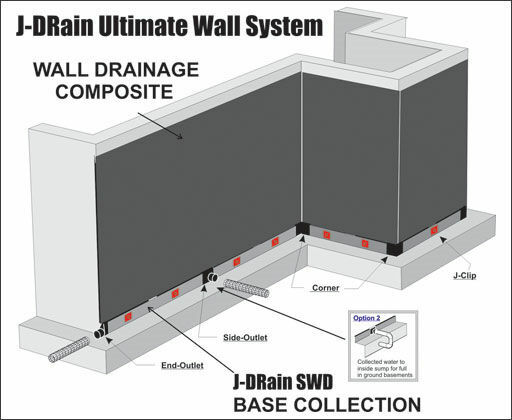 Combines J•DRAIN SWD collection system with 8.5 ft of J•DRAIN wall drainage composite. 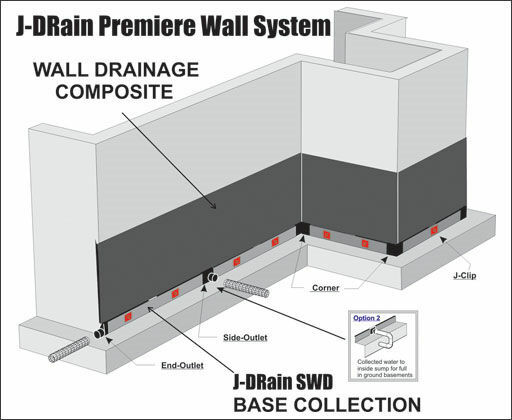 Full wall coverage helps protect the waterproofing a forms a barrier between the soil and foundation wall. This also allows a passage for water towards the bottom of the foundation wall to the collection system. 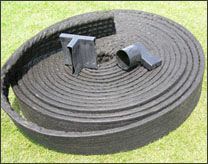 J•DRAIN SWD is a composite turf drainage system consisting of a 3-dimensional, high flow, drainage core and a non-woven, needle-punched filter fabric. The filter fabric is wrapped and bonded to the drainage core, preventing intrusion of the filter fabric into the flow channels during the backfilling process. Soil particles are held back by the filter fabric and water passes through to the drainage core allowing water to be collected and conveyed to the discharge point. Available in 6 inch and 12 inch widths. Roll lengths are 165 feet.